Pyramids Of Mars / "Pyramids Of Mars" / "Pyramids Of Mars" / "Pyramids Of Mars"
When fans of Doctor Who have gathered in their collective wisdom to choose which stories are best, or at least most popular, “Pyramids Of Mars” routinely ranks very, very high. In the well-known Mighty 200 poll that Doctor Who Magazine did in 2009, for instance, it’s the fourth-highest Classic-era story out of more than 150, topped only by “Caves Of Androzani,” “Genesis Of The Daleks,” and “Talons Of Weng-Chiang.” That seems a little off to me—considering how slapdash and full of plot holes its finale is, I can think of a dozen Doctor Who serials I’d rank more highly in my personal list, including two made the same year. And yet even if it doesn’t quite hang together at the end, there are a wealth of terrific moments on the way there. I still enjoy the hell out of it. So the salient question isn’t so much whether “Pyramids Of Mars” is overrated—it is, but not absurdly so—but what it does right, despite its flaws, that makes it seem such a pure example of what the show is supposed to be. Think about that concept for a second. Not just robots. Not just mummies. Robots who are also mummies. It’s simultaneously awesome and absurd, and part of a grand tradition of Doctor Who monsters that are scary and silly and kind of lovable all at once, in a way that’s hard to find in other science-fiction shows. The reason why there are robot mummies in this particular story, of course, is that the creative team during the early Fourth Doctor years loved nothing better than making pastiches of older sci-fi and horror, and “Pyramids Of Mars” was going after an obvious target—the Egyptian-themed horror movies made by Universal and Hammer like Boris Karloff’s The Mummy. So, along with the other imagery and atmosphere you need to homage those films—trap-strewn tombs, gilded sarcophagi, sinister men in fezzes—you need some creepy slow-stalking figures wrapped from head to toe in bandages. Gotta have mummies in your Mummy homage, and because Doctor Who always tries to explain its fantastical elements with at least a feint at science over sorcery, they really can’t quite be, say, corpses reanimated by magic—so, robot mummies it is. And (I’m probably belaboring the point here, but bear with me) even though the overall style of the series makes robot mummies feel like the right choice, the internal logic of the story itself makes that twist unnecessary. The Doctor’s enemy here is Sutekh, an ancient and powerful alien who is, essentially, the Egyptian god of death. He’s paralyzed and imprisoned in a tomb on Mars, totally powerless until an archaeologist foolishly breaks into the corresponding tomb in the Nile Valley and activates a gateway between Earth and Mars. Though still paralyzed, Sutekh now can use some of his formidable mental powers, which include reanimating the dead—which is how he turns the unlucky Marcus Scarman into his chief henchman. So there’s no reason Sutekh couldn’t just create traditionally undead mummies. This contradiction, too, is pure Doctor Who. The central relationship in any Doctor Who story is the one between the Doctor and his traveling companions, in this case Tom Baker’s mercurial Fourth Doctor and Elisabeth Sladen as plucky journalist Sarah Jane Smith. There’s a good case to be made that this duo is the quintessential Doctor/companion pairing of the entire Classic series, not just for the two actors’ great chemistry together, but the way the character dynamics between the Doctor and Sarah helped the emotional flow of the story as a whole. Before I get into that it’s worth pointing out how different the Fourth Doctor had become, here in the second year of his run, than any of his predecessors. For one thing, although the Doctor had always been a man of eccentric and formidable intellect, Baker’s stories under script editor Robert Holmes increasingly emphasized him as having greater than human knowledge and power, and a dark, imperfectly hidden burden of responsibility because of it. This is really a new thing for the series up to this point—the First and Second Doctors often triumphed by making their enemies underestimate them, and while the Third was arrogant, he picked his squabbles with bureaucrats and the Brigadier. The Fourth seems almost arrogant enough to view Sutekh as an equal, or at least someone he can handle without calling for backup, whether from UNIT or the Time Lords. One practical advantage of this in terms of scriptwriting is that if the Doctor already knows about the arcane threat of Sutekh, back story and all, no screen time has to be wasted in discovering it, because the Doctor knows Sutekh is and what he’s capable of already, and selling that threat to the audience can be done simply by letting Baker sink his teeth into the dialogue. (“The forces that are being summoned into corporeal existence in that house are more powerful and more dangerous than anything even I have ever encountered. Stay here.”) That approach eventually leads to pompous grandiosity in later seasons, but here, while Baker is careful not to overdo it, he perfectly captures the idea of the Doctor as a moody, often chillingly distant mystic science-wizard. I could go on—there are so many memorable bits. The seemingly fatal gunshot that causes Marcus to expel smoke from the wound, which eerily reverses itself and goes back into his body, a simply yet very effective special effect. And the darkly funny shock when Sarah tosses a box of unstable explosives to the Doctor, clearly never having seen that one episode of Lost. And finally, leading a remarkably strong supporting cast with just his voice is Gabriel Woolf as the trapped Osirian god. Remembering how utterly awful characters like Omega and the Shadow have been in other serials when the actors try to compensate for their full-face masks by going loud and hammy, Woolf’s Sutekh offers a master class in achieving a very powerful sense of menace by underplaying it. Switching gears a bit, there’s a pretty major shift in the series taking place in this story, and throughout the thirteenth season, a little bit outside of the stories themselves—namely, the final curtain being drawn on the Third Doctor’s central identity as part of the Earth-based military group UNIT, which had been a huge part of the show for five years and still lingered even though most of season 12 had taken place elsewhere. 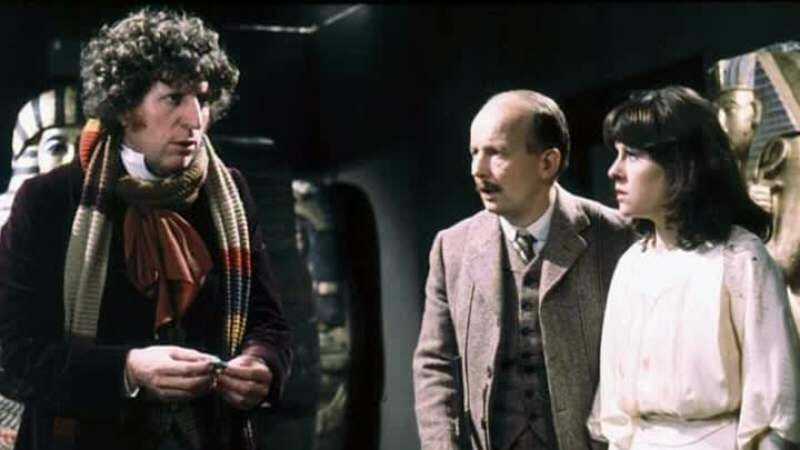 Eliminating UNIT and its stable of supporting characters was something that had to happen, given producer Phillip Hinchcliffe and Robert Holmes’ desire to return Doctor Who to its roots as the story of a wandering stranger. Being stuck on Earth with a job and a boss was antithetical to that whole concept. That was, of course, the whole point of sticking him with UNIT in season seven when the producers wanted to do something new for the Third Doctor’s run, but going back to the old ways meant radically rescinding that radical change. It’s interesting to see the route they chose to accomplish this: Rather than wrapping things up neatly and tidily with some kind of grand farewell story in which the Doctor officially says goodbye and moves on to the next phase of his life—which they could have easily done in “Terror Of The Zygons”—UNIT has a strange diminishing half-life that sputters through the season until they finally fade away without ceremony. “Zygons” begins the season with a full-fledged, proper appearance by the Brigadier and company, but it’s also clear that the Doctor’s viewpoint has changed, and not for the better—he actually threatens the Brig that he’d better have had a “very good reason” to call in his help. In “Pyramids of Mars,” the Doctor lands at the location of his lab in UNIT HQ, something that’s been a familiar landmark to viewers for six years. But he’s landed about 70 years too early, and instead of the scientific equipment we should expect, we get a macabre tableau of Egyptian sarcophagi, inside of which are lurking killer robots designed to look like dead men. Next, there’s “The Android Invasion,” featuring lurking killer robots designed to look like Doctor Who’s former supporting cast. And in “The Seeds Of Doom,” UNIT is reduced to a mere token, with none of the familiar cast members appearing at all. And the Doctor’s first scene in “Pyramids” makes me wonder whether he might have been trying to influence this change through his own travels through time. He opens by complaining that it’s “about time I found something better to do than run around after the Brigadier.” And then he lands the TARDIS decades early at the “right” place, where he ends up causing the fire that burns down the building that was there before UNIT HQ was built. So he creates, in a minor way, part of the necessary conditions of UNIT’s existence and therefore his own relationship with them. 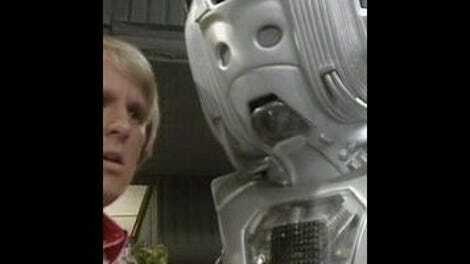 But he also makes a point of bringing Sarah forward to 1980 to show her that the future can be changed. Doesn’t that imply that changing the future was on his mind already—perhaps by slightly tweaking the history of UNIT so that it wouldn’t be necessary for him to work with them anymore? I’m speculating wildly, but hey, it’s one way a time traveler could quit in style. If you’re the Doctor, you can hand in your two weeks’ notice anytime you want—present, future, or past. • Originally broadcast Oct. 25-Nov. 15, 1975. • A bit of old continuity pops up, in keeping with the old-timey setting in 1911—Sarah finds an old dress left behind by the Second Doctor’s companion Victoria, leading the distracted Fourth Doctor to momentarily mistake Sarah for her. • The Doctor alludes to the Great Fire of London with his comment about having “enough of that in 1666,” suggesting that he was blamed for starting it. One imagines this is some unseen adventure in which he was falsely accused, because as we later find out, he did start the fire, but not until his fifth incarnation. • Notice that Sarah claims to be from 1980 even though “Pyramids Of Mars” was made in 1975? It’s complicated, but this is basically the last appearance of the notion that all the Third Doctor’s UNIT-related stories were set not in our present but the not-too-distant future (next Sunday A.D.). • My last Doctor Who Classic review will be the Seventh Doctor’s aptly named “Survival,” the final story of the original 1963-1989 run of Doctor Who.